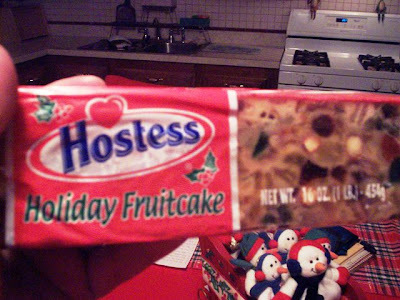 This week's BITE OF THE WEEK is Hostess Fruitcake . And maybe next week's too ........cause I'll probably still be chewing it . What the hell is this stuff made of ? 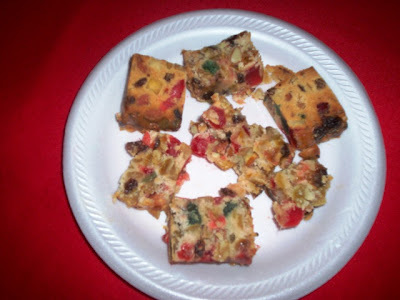 Laura had been dying to try fruitcake , since she's heard so much about it .....mostly bad ! So we picked up this heavy log of fruited cake ( crap ? ) from the market and took it home to enjoy . Except we didn't enjoy .....not at all . In fact , we ended up throwing most of it out . Even Dad didn't like it and he'll eat the tail end of anything ! How to describe it ............it was dense , heavy , more damp feeling than moist , had a funky taste ( like they tried to make it rum-flavored....but failed ) and was chewy ....very chewy . I was still chewing LONG after I had swallowed my piece . WTF ? Maybe this is why .....when people receive one ......they just wrap it up and send it on to someone else . 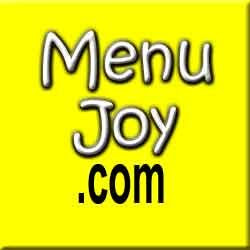 Some of these things are YEARS old !!! 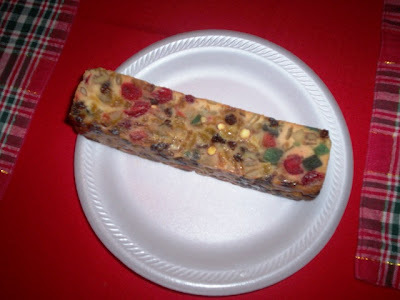 I think this will be our first & last taste of fruitcake . Until they make it taste like CHEESECAKE .....I'm all set .